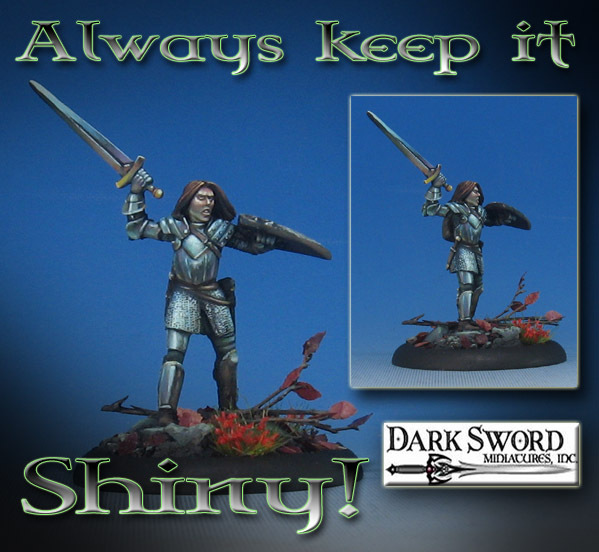 James Wappel Miniature Painting: Always keep it Shiny! This latest version of Painting Dark Sword had a few things which were very new, and some things that go back several years to the original Painting Pyramid video series! For those of you familiar with the way I have been "Primer Painting" the figures in pre shaded fashion, this will look quite different. I simply brushed on some Badger Stynlrez primer, using the reddish brown color. From there, I would work in a more 'classic' Shaded Basecoat fashion. You can also see the reference images of armor in the corners, which were a very helpful guide through the process. 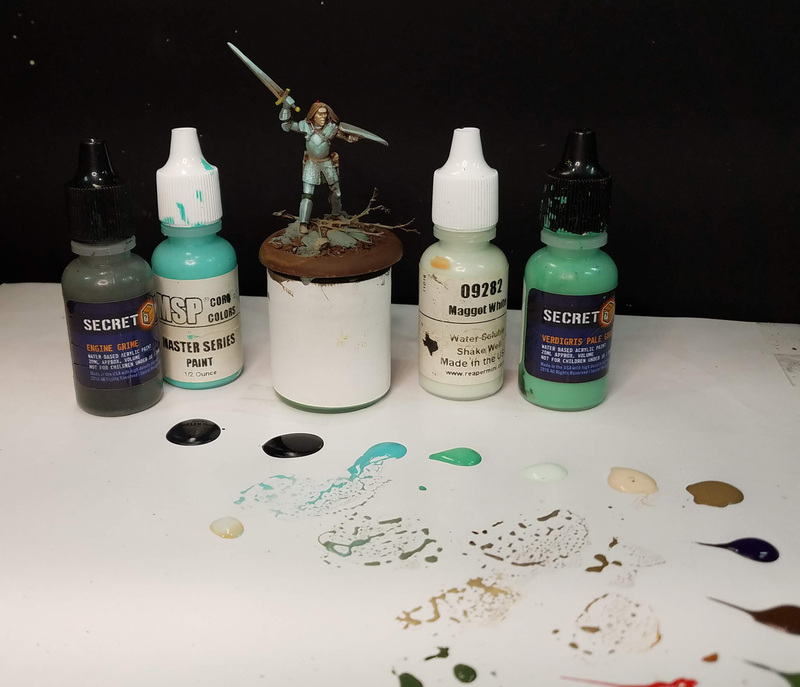 You can see the image on the left which has those glazes, which are meant to shade and add more tones to that Shaded Basecoat. The image on the right shows how it has progressed further, with the midtones and other lights added. 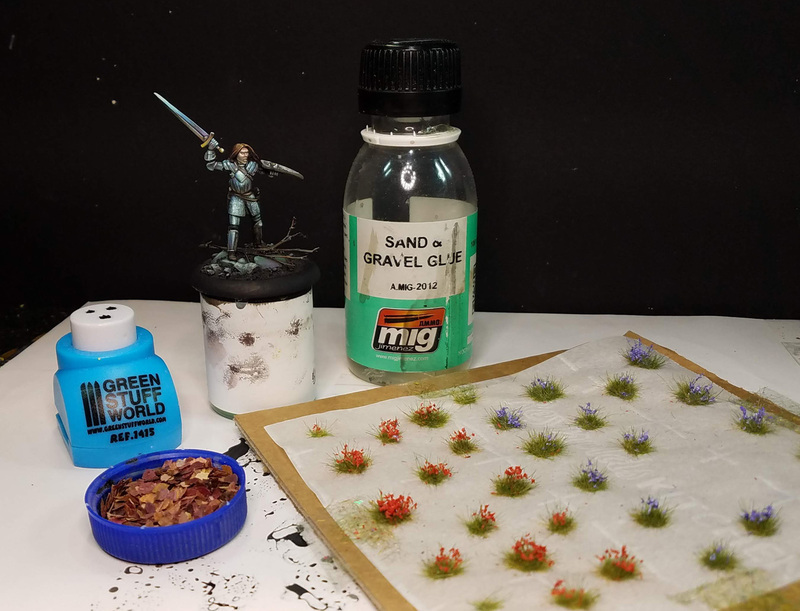 From there it was time to have some fun with the basing, and I brought out the Green stuff World leaf cutters! I also used a few of my home made flower tufts. The finished result! 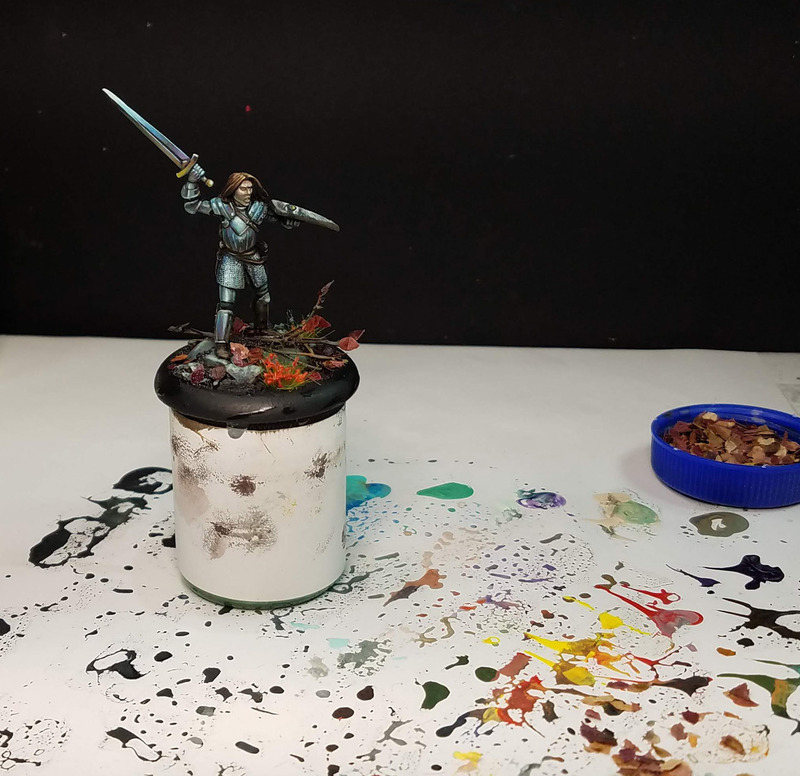 This was a typical episode of Painting Dark Sword... roughly 2 hours long and chock full of tips and techniques. I try to do more than show you what I am doing. The goal is to explain WHY I am doing a certain action or using a certain material. 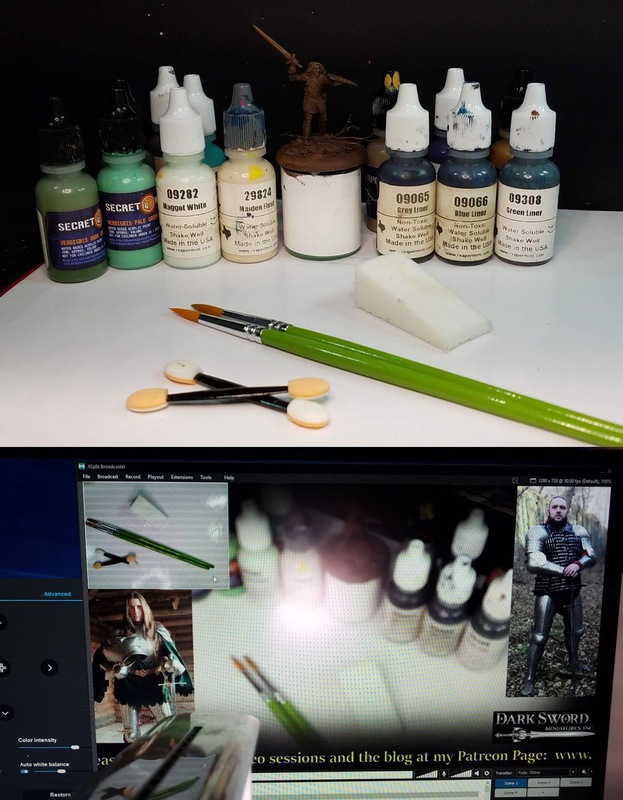 This episode allowed me to show how to get as many colors as possible into your metals, working in glazes that were not only shading and tinting existing colors, but also lightening them. Yes, glazes are not always darker. It is possible to add lighter, softer tones in transparent fashion to smooth out certain areas that are rougher. Again, many of the principles that are discussed in this video harken back to the original Painting Pyramid series of videos, which featured 53 titles covering dozens of painting techniques, specialty effects, 12 basing videos and even 5 terrain videos! Several of these are now part of my Patreon Page, and I am building off these once again. 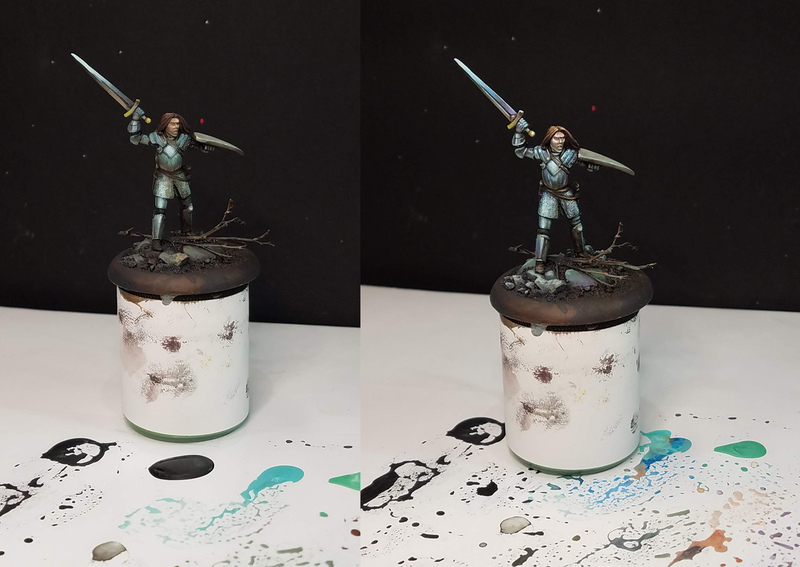 You can see those with the $10 Dark Sword pledge, along with tutorial videos on the Black Heart Models busts.